The publisher has been the digital comics service’s most notable holdout for a long while—but that appears to have (finally) changed now. DC Comics are now available via ComiXology Unlimited, which is absolutely huge news. 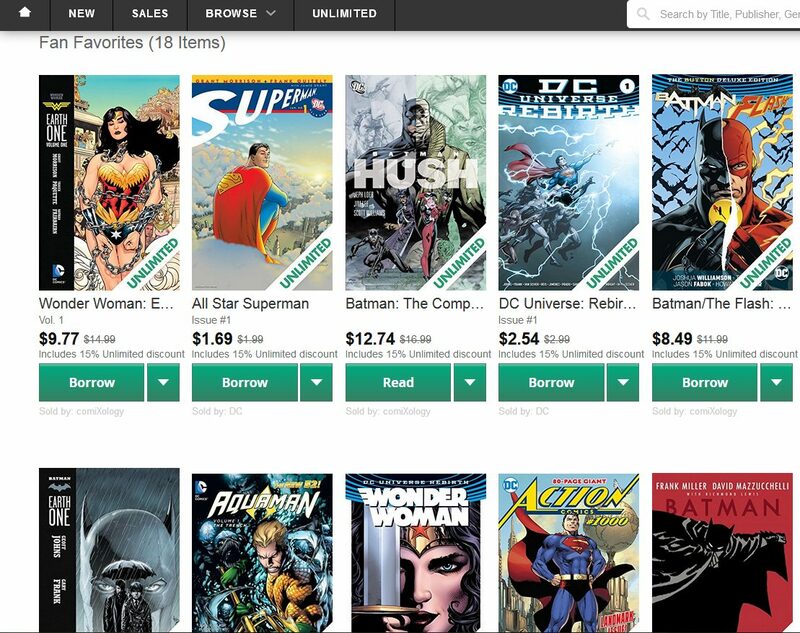 For a long while (as long as I’ve been a subscriber anyway, which goes back at least a year or two now), DC has been the lone notable holdout for the Amazon-owned monthly fee-based digital comics service. While Marvel, Dark Horse, and Image Comics were available in somewhat ample supply—allowing readers to checkout early volumes of everything from recent Amazing Spider-Man runs to Hellboy to Saga—there was nary a Superman, a Batman, or a Wonder Woman to be found on the platform. That, however, has changed. The proof is on the ComiXology Unlimited page itself (with its capital X in the middle and all). On Tuesday morning, unlimited subscribers have new access to bedrock DC titles like Watchmen and All-Star Superman, as well as other more recent work, including some of the Earth One books, the Batman/Flash Rebirth crossover, and Action Comics #1000, among others. This is a big deal because DC has largely avoided this sort of broad monthly-fee based comics platform. While Marvel has given readers access to much of its back catalog for years via Marvel Unlimited, DC didn’t have a commiserate service until late last year, when it launched its DC Universe streaming package. Even then, calling it commiserate to Marvel Unlimited is maybe a little generous, light as DC Universe was at launch…at least on the comics selection. Exclusive DC Universe shows like Titans and Young Justice Season 3 (which dropped last week) were met with a more satisfied reaction from a lot of fans. It’s also worth noting that there will be no fee increase for ComiXology Unlimited in the wake of this addition, and that the new books will also be available through Kindle Unlimited and Prime Reading. Anyway, that’s really all there is to it right now. If you’ll excuse me, I’m off to re-read some of my favorite Rebirth runs (Greg Rucka, Nicola Scott, and Liam Sharp’s Wonder Woman, to be exact), which I’ve been meaning to revisit but haven’t wanted to dig in my closet to find the floppies. My monthly comics budget just got cheaper. Now I can also catch up on must-read DC titles (or at least first installments) along with the Indies I read on Comixology Unlimited. Hopefully these features allow readers to find new favorite characters and spring into ongoing series from DC. Also, don’t forget that Comixology Unlimited gives an automatic 15 percent discount on all new purchases from DC. So even purchased issues and collections will be cheaper going forward. I dropped about a 120 bucks during the year end sale on DC books. I don’t know how this stuff works out for creators but this is a big jump for digital comics. The press release reference to “fans around the globe watching the top-gross movies” ( or similar words) is a bit ironic. Comixology Unlimited, according to their own website today, is not available outside the USA. So we aren’t eligible for this new DC addition either. And now, back to watching top grossing movies streaming instead.